I’ve always had something of a soft spot for Wales. It may be the natural beauty and friendly inhabitants, or it might have something to do with the fact it was the first place I visited outside of England as a child. Being the closest to going abroad I’d get for some years I duly embraced the experience, trying to pick up parts of the language, a vocabulary which unfortunately hasn’t expanded since. This trip, however, made me see Wales in a whole new light as I’d explore the natural treasures it has to offer. First was a popular tourist attraction nestled in the Brecon Beacons - The National Showcaves Centre for Wales. Dan yr Ogof is the centerpiece of the site, an eleven mile cave system discovered in 1912 by the Morgan brothers and further explored by cavers for generations to come. Although visitors are not allowed to explore the entire system, there’s plenty still to see. Not only that, but there are two other caves open to the public – Cathedral Cave, a much more open space, and Bone Cave, thus named for the 42 human skeletons dating back to the Bronze Age that were discovered there. By far the smallest cave, it seeks to be the most educational, demonstrating humans’ use of the caves in the past and the other animals that would have shared the space. The Centre also boasts one of the world’s largest dinosaur parks with over two hundred life-sized models placed around the site. I’m not entirely sure why they’re there but they were set up within the landscape to look quite natural, and the dinosaur obsessed child within will likely be delighted by their presence. There’s also a small display of an Iron Age Farm. If you’re interested in Iron Age life I’d recommend a trip to Castell Henllys instead where you are able to go inside the recreated roundhouses. From here we went in search of Barafundle Bay. 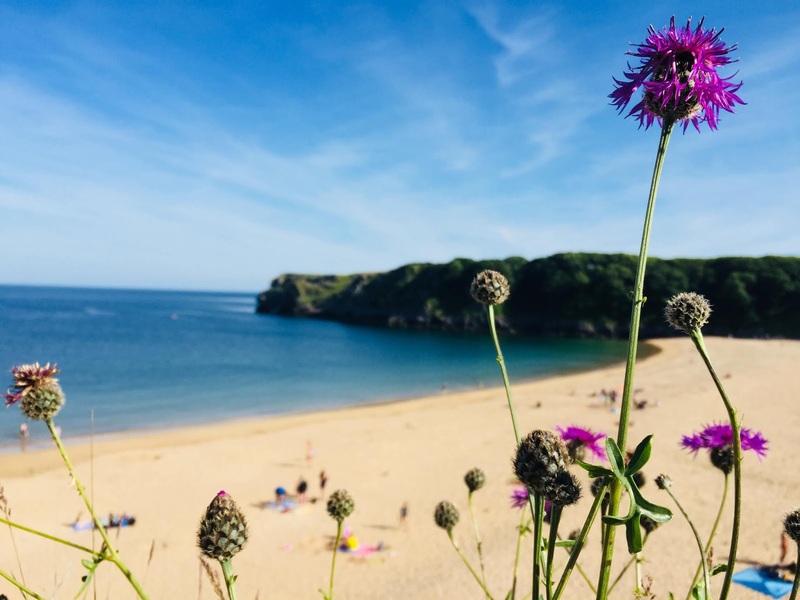 Part of the Stackpole Estate managed by the National Trust and voted among the world’s best beaches, it truly is a treasure. Accessed via a clifftop walk, it manages to retain a sense of seclusion even as its popularity grows. The geologically minded will enjoy the walk for the examples of both Carboniferous limestone and the red sandstone rocks. Whether you know about the landscape or not you can’t help but enjoy the clear water (which was still painfully cold), caves, pine trees, and sand dunes that surround this beautiful beach.